Genetic and molecular testing can provide doctors with important information to aid them in the diagnosis and treatment of certain melanoma cases, Dr. Chu says. These tests are widely available through academic centers and commercial laboratories, she says, and many are covered through insurance or available at no additional cost to the patient. 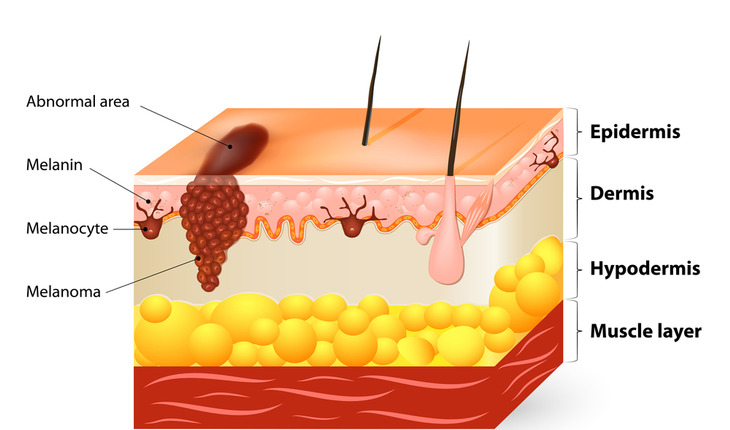 Skin cancer is typically diagnosed through tissue biopsy, but biopsy results are sometimes unclear. In these cases, Dr. Chu says, doctors can utilize additional tests to help determine whether a lesion is malignant. Additionally, if a patient is diagnosed with advanced-stage melanoma, testing may be able to identify which treatments are most likely to be effective, she says. If a biopsy does not clearly indicate whether a lesion is a malignant melanoma, Dr. Chu says, comparative genomic hybridization or fluorescent in situ hybridization may be helpful in determining a diagnosis. In both of these tests, doctors look for signs of melanoma as they compare the DNA in tumor cells to the DNA in normal tissue. According to Dr. Chu, doctors also may utilize gene expression profiling to gather additional diagnostic information. This type of test, which screens the patient’s tissue for genes associated with cancer, may be used to determine whether a lesion is malignant. In advanced melanoma cases, doctors may utilize next generation sequencing testing, which examines a melanoma for specific mutations, allowing doctors to select an appropriate targeted therapy and provide the best possible treatment for the patient. For example, Dr. Chu says, this type of test may identify BRAF mutations in melanomas, which in turn may be treated with BRAF inhibitors, a type of drug that can shrink tumors and stop further growth by “turning off” cancer genes. Patients who have heard of genetic and molecular testing may believe it can determine their risk of melanoma recurrence, Dr. Chu says, but such testing is currently in the early stages of development. While some tools currently available for the general public can estimate one’s likelihood of developing certain diseases, including skin cancer, she says, these tests are not necessarily reliable. “Only a doctor can evaluate your melanoma risk or diagnose a suspicious lesion,” she says.